When percussionist Sameer Gupta last performed in the Bay Area, he was leading an unprecedented East-meets-West exploration of Terry Riley’s protean minimalist composition, "In C."
At the Yerba Buena Gardens Festival last September, the energizing performance brought together string players from the Bay Area collective Classical Revolution with musicians from Brooklyn Raga Massive, Gupta's collective devoted to Indian classical music. Riley’s cellular cycle provided an ideal vehicle for the rhythmically charged encounter, a concept that Brooklyn Raga Massive captured on the album Terry Riley In C (Northern Spy Records) with a cast of New York musicians. Back in the Bay Area for a series of concerts, Gupta is navigating a different kind of cycle. At the release show for his new album, A Circle Has No Beginning, at Berkeley’s Freight & Salvage on Aug. 19, he’s presenting original music that that brings together another brilliant bridge-building ensemble that combines East and West Coast and Eastern and Western musical traditions. Originally from Fremont, Gupta spent his formative years in the Bay Area scene before decamping for Brooklyn in 2008. At his upcoming album release show, a bevy of accomplished musicians will join him on stage. The diverse lineup includes jazz bassist Rashaan Carter—who’s performed around the Bay Area with trumpet great Wallace Roney—and conservatory-trained cellist and vocalist Marika Hughes, a supremely versatile artist who was a crucial part of the Bay Area’s creative string scene from 1994-2005 via her work with violinist Carla Kihlstedt’s experimental ensemble 2 Foot Yard, vocalist Jewlia Eisenberg’s Charming Hostess and violinist Jeremy Cohen’s Quartet San Francisco. Gupta didn’t connect with Hughes until they were both living in New York, but the album release concert draws on several overlapping circles from his California days. San Francisco Carnatic alto saxophonist Prasant Radhakrishnan, Sacramento guitarist Ross Hammond and tenor saxophonist David Boyce of the group Broun Fellinis (with whom Gupta played and recorded in the ecstatic free jazz ensemble The Supplicants) will also perform with the percussionist. When Gupta moved east, he brought the Classic Revolution idea with him, and, working with sitarist Neel Murgai, based BRM on a similar concept. Since then, BRM has steadily expanded into a major arts organization, producing festivals, holding weekly sessions and events like the recent showcase at Queens Botanical Garden, Women’s Raga Massive. Marika Hughes started playing with Neel Murgai’s ensemble and has kept an eye on BRM as its grown from its initial initial sessions in Gupta's basement. “It’s amazing to watch what they’ve created," she says. While the Aug. 19 album release concert at Freight & Salvage for A Circle Has No Beginning is the centerpiece of Gupta’s Bay Area sojourn, he has several other engagements. On Aug. 23, he focuses on the drum kit when he rejoins forces at San Jose’s Café Stritch with bassist David Ewell and alto saxophonist Prasant Radhakrishnan in VidYa (the date was originally billed as The Supplicants). And on Aug. 24, he plays a solo tabla recital as part of vegan chef Philip Gelb’s dinner concert series in Oakland, a reunion that completes another musical circle. 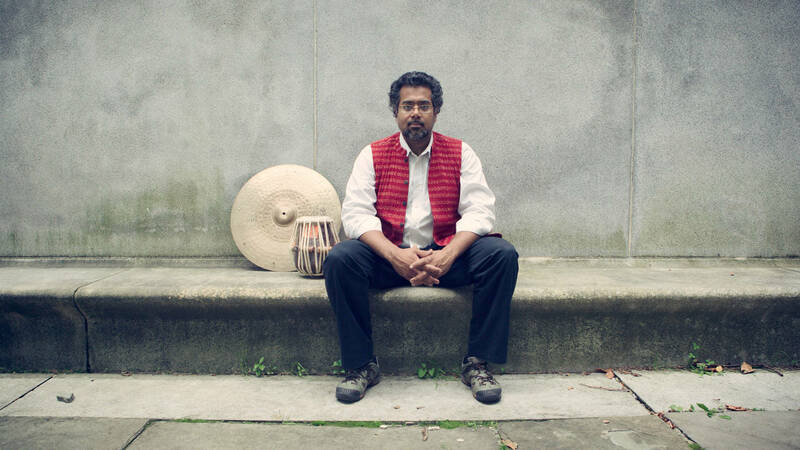 Beyond his ambidextrous mastery of the drum kit and tabla, Gupta’s talents manifest in his ability to create musical situations that seamlessly encompass disparate worlds, like adding Gelb’s Japanese bamboo flute to the Indo-Riley extravaganza. A circle might have no beginning, but in Gupta’s hands, the infinite continuum is an open door that allows musicians to be themselves even as they explore unfamiliar territory. Sameer Gupta performs at Berkeley's Freight & Salvage on Aug. 19, at Cafe Stritch in San Jose on Aug. 23 and at Philip Gelb's dinner concert in West Oakland on Aug. 24.